The Terai Arc Landscape (TAL) is an 810km stretch between the river Yamuna in the west and the river Bhagmati in the east, comprising the Shivalik hills, the adjoining bhabhar areas and the Terai flood plains. It is spread across the Indian states of Uttarakhand, Uttar Pradesh and Bihar, and the low lying hills of Nepal. 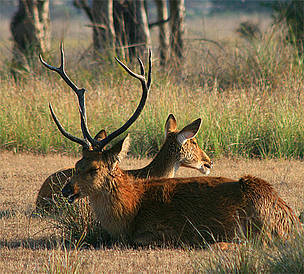 The landscape boasts of some of India’s most well-known Tiger Reserves and Protected Areas such as Corbett Tiger Reserve, Rajaji National Park, Dudhwa Tiger Reserve, Valmiki Tiger Reserve and Nepal’s Bardia Wildlife Sanctuary, Chitwan National Park, and Sukhla Phanta Wildlife Sanctuary. In total, the landscape has 13 Protected Areas, nine in India and four in Nepal, covering a total area of 49,500 km2, of which 30,000km2 lies in India. These forests are home to three flagship species, the Bengal tiger (Panthera tigris), the greater one horned rhino (Rhinoceros unicornis) and the Asian elephant (Elephas maximus). Apart from these, there are several other species of cats such as the rusty spotted cat, fishing cat, jungle cat, leopard and leopard cat, as well as antelopes and deer such as the four horned antelope, sambar, chital, hog deer and barking deer. Other wildlife includes the sloth and Himalayan black bear, yellow-throated marten, Indian pangolin, Himalayan goral, Gangetic dolphin, gharial and crocodile. The Protected Areas in this landscape are connected with one another through wildlife corridors, which are mostly part of the interconnected Reserve Forests. These corridors are used by wildlife, especially large mammals, to move from one forest to another, in an attempt to find new territory, mate and prey. WWF-India has been working in TAL since 2000 with the aim of ensuring habitat integrity and connectivity across the landscape for key wildlife populations while providing alternate livelihood options for local communities within an enabling policy and institutional environment.